Ludo Studio’s delightful animated preschool series Bluey premiered on ABC Kids this month, and my four-year old daughter is its second biggest fan. Following me. 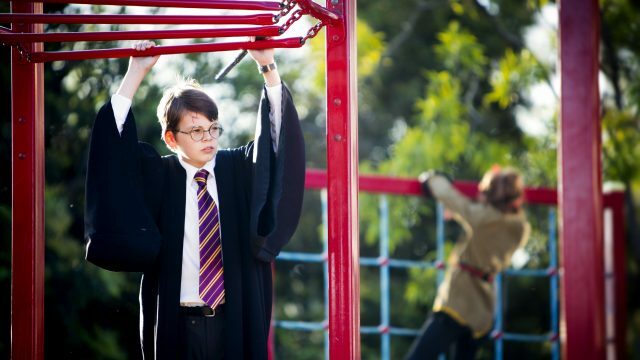 This Queensland-produced series nails the representation of life with young children. It follows an endearing family of cattle dogs living in Brisbane: six-year old Bluey, her four-year old sister Bingo, their mum Chilli, and dad Bandit. In each episode, Bluey and Bingo channel their boundless energy into playing game after game, drawing family and friends into their rich imaginary world. Parents of Australia, here are five reasons why you will genuinely enjoy Bluey as much as your children will. The stories in Bluey are the stuff of everyday family life, which is exactly what makes them so great. Chaperoning the kinder teddy around town, exploring the back yard, setting screen time limits. And lots and lots of games. Sisters Bingo and Bluey spend most of their time in unstructured, self-directed play at home. When their dad dares to lie down, a game of ‘hospital’ ensues. The whole family plays ‘keepy uppy’ when Bluey finds a balloon, and a visit from Uncle Stripe and the cousins inevitably leads to horsey rides. Through their play, the pups learn to take turns, co-operate, solve problems, and bounce back from disappointments – but these lessons never feel heavy-handed. We do so much of this unstructured play in our family, and it’s wonderful to see it celebrated on screen. Yesterday my daughter invented the ‘escalator game’, carefully positioning her soft toys along the staircase. She also devised the somewhat less sophisticated ‘shoe game’, which had only one objective: throwing shoes. Bluey gives us insight into how other families play, and new ideas for games to play together. It’s also affirming for kids to see stories that are relevant to their own experience of the world. In another animated series for this impressionable age group, Princess Holly lists ‘looking pretty’ as an athletic strength. I have never forgiven her. Bluey, on the other hand, builds a rare representation of young children as the complex people they already are. Thankfully unconcerned with looking pretty, Bingo and Bluey are firmly focussed on the real work of childhood: play. They dance, dress up, and give their dad makeovers, but they also enjoy water play, getting messy, and closely examining bird poo. These playful adventures unfold to a lifelike soundtrack – that enthusiastic stream-of-consciousness chatter that young children excel at. It’s mostly – but not all – fun and games for the pups. In the moving episode ‘Bike’, Bluey struggles to master riding her bike. But as she watches her friends’ determination to conquer their own challenges – like putting on a backpack, or reaching the monkey bars – she is inspired to give it another try. And in ‘Hotel’, she learns to compromise after Bingo quits their game in frustration. 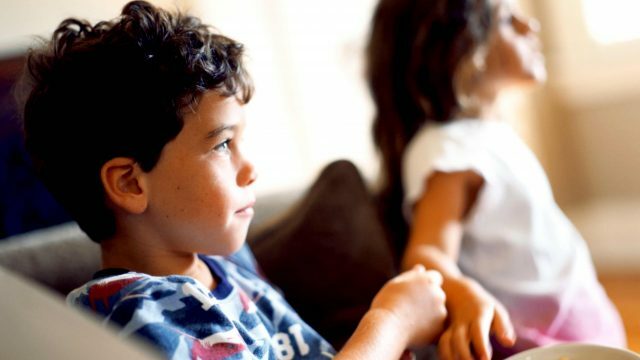 These age-appropriate conflicts are approached with the lightest of touch, and give parents a springboard for discussion and learning with their kids. Bluey has an authentic and funny take on the ups and downs of family life with young children. Chilli and Bandit work hard wrangling the kids, playing with them, encouraging them, comforting them… and then they collapse at the end of the day. In the opening scenes of ‘Hospital’, even seemingly inexhaustible Bandit asks the kids: “Is there some game where I just lie really still on a comfy bed or something?” Admit it: you’ve been there too. Unfortunately, most children’s television isn’t immune to the bumbling dad trope that is so common in adult’s comedy. In series after series, we see fathers portrayed as well-meaning but ultimately clueless. They fall in pools, become stuck in cement, and don’t know their own names. (Daddy Pig, King Thistle: I’m looking at you.) This negative stereotype is overplayed, and not representative of the involved parenting I see from many contemporary fathers. In a welcome change, Bluey’s dad Bandit is present, competent, and as enthusiastic about silliness as his kids are. We learn that Bandit literally dreams about touch football with his friends – because he’s too busy working and parenting to play in real life. Bluey and Bingo see him as the centre of their world, and episodes including ‘The Weekend’ and ‘Fruitbat’ highlight the strong bond he has with the girls. Bandit is portrayed as an equal partner to Bluey’s mum, Chilli. A similarly fleshed-out character for a children’s show, we see Chilli juggling work, kids, and finding time for the occasional run or game of hockey. Visiting from overseas two years ago, a friend remarked that my toddler daughter had an accent she couldn’t quite place. Then it hit her: my child sounded like Peppa Pig. Of course I took this as a terrible indictment of my parenting skills, but it was hardly surprising. Most preschool content on ABC Kids was imported from the UK, and my daughter was taking it all in just as she learnt to speak. By contrast, the characters in Bluey speak in broad Australian accents about familiar events, using familiar colloquialisms. And it is so refreshing. Along with unexpectedly good music, the soundtrack includes the squawking of rosellas, droning cricket commentary, and other recognisable sounds. Our kids deserve access to great content like this which genuinely reflects their language, community and culture. Inspired by the warm palette of semi-tropical Queensland, the series also looks unmistakably Australian. Bluey and her family live in a rambling Queenslander house in Brisbane. We see a barbecue on the back deck, wheelie bins in their driveway, and magpies on the fence. The pups play under the backyard Poinciana tree, and their hilly neighbourhood is dotted with purple-blue jacarandas. This is worlds apart from the generic settings we regularly see in ‘Australian’ animations. For many children, Bluey is the first distinctly Australian animation they will see. 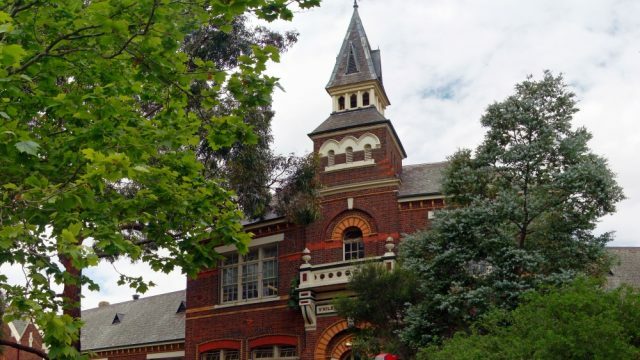 It will contribute to their perceptions of Australian life and their developing national identity, and will no doubt hold a special place in their imaginations for years to come. 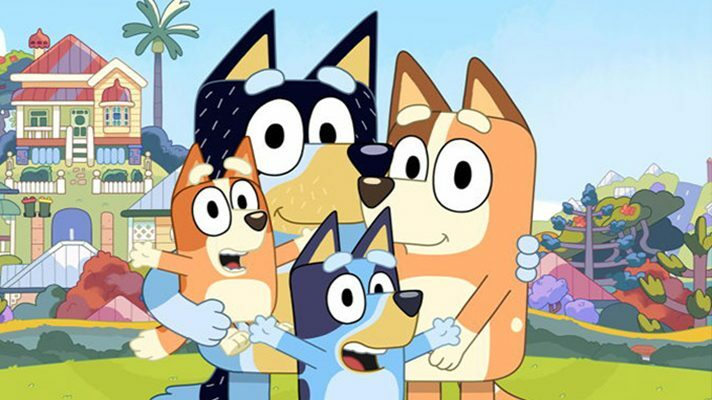 While it’s not usually front of mind when watching TV, parents can feel good about supporting the Australian children’s television industry as they laugh along to Bluey. The series was created and produced wholly in Australia. Creative house Ludo Studio produced the series in South Brisbane, with local graduate students from QUT and Griffith University making up more than half of the project’s workforce. The cast is also made up of local talent. Bandit is voiced by Dave McCormack, musician and frontman for the Brisbane band Custard. Queensland actor Melanie Zanetti plays Chilli, while Bluey, Bingo and some of their friends are voiced by children of the production crew. As a regular viewer of ABC Kids, I saw a different approach to this series premiere, suggesting the ABC is investing in Bluey as rare Australian content. Promotion for the series started one month out (creating an exercise in patience for my excited daughter), and a preview episode was released on Facebook ahead of the official premiere. When the first episode was uploaded to iview, another four unaired episodes were also shared on the platform. This provided an extremely valuable tool for parents wanting to use new Bluey episodes to bribe their young children. Ahem. 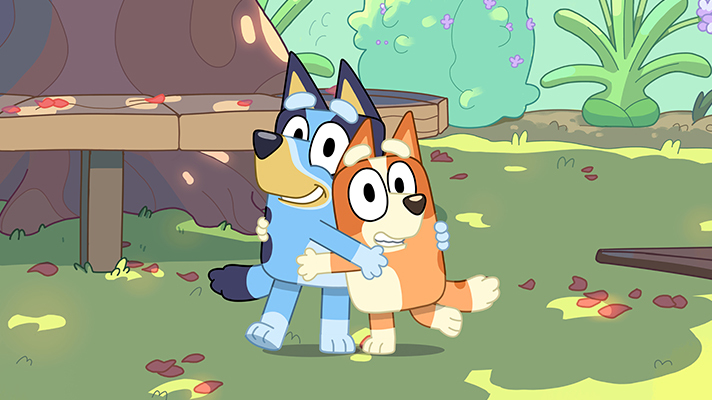 If the above five reasons haven’t convinced you, I know this will: there are 52 episodes of Bluey to look forward to. This kind of variety is priceless when you know you’ll be watching each episode 7,000 times on iview. 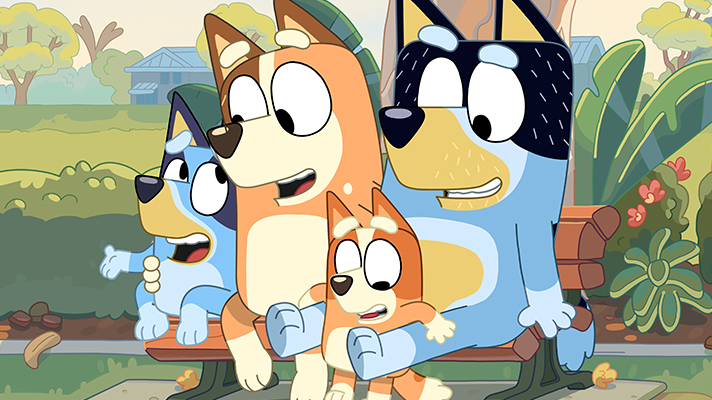 Bluey airs at 8am each day on ABC Kids, and the series is also available on ABC iview. I wholeheartedly agree Janine! You know it’s so good when your other half says “what happened in Bluey today?”. Such a fresh and fun show that is really resonating with parents. I dropped everything to be in front of the TV at 8am this morning, and loved the hilarious new episode ‘The Doctor’. Thank you to all the Bluey team at Ludo for bringing this series to the ABC. It is about time, we now have some real Aussie entertainment for our kids. Our 2 granddaughters Izzy & Josie just love Bluey and all her family and friends. Of course Grandma loves Bluey too. We wait each morning to see what will happen in the next episode. Brings back memories of my childhood. It’s definitely a show that grandparents and parents can enjoy watching too. Lots of laughs for adults and kids alike! Bluey has been an instant hit in our house. Thank you Janine for articulating all the things we’re loving about it! I’ve also been wondering, is this the first kids show with mutiple girls as the only kids in the family? In most other kids shows I think it’s families with a boy and a girl, one girl, or all boys. So glad to hear that your family is loving Bluey too! You're absolutely right that many children's shows have either a male lead, a male and female co-lead, or an ensemble cast - it's so rare to see sisters as the focus. The only other sisters I can think of on ABC Kids' current schedule are Dana and Saara, stepsisters in the Canadian live action series Dino Dana. The fantastic Australian teen series Mustangs FC also features stepsisters, but this is pitched at an older audience. Any other ideas, readers? I really think, as you mention, that they nailed it about Bandit as a dad vs almost every other dad on television. Bandit really has the dad role without having to turn himself into something else. This is what most dads try to do, but it is not always easy to remain confident about your approach when almost every father on tv is charmingly dimwitted, or clueless, or (in the few cases where functional dads are portrayed) more like a professional early childhood educator than a real human with a personality, emotions, ideas and capability of being nurturing while still being who they really are. I think the group who will benefit second best from Bluey are kids (! ), fathers who watch being the greatest beneficiaries - it gives us ideas on how we can be ourselves and be the fathers we want to be. Since Bluey arrived on TV I have become a better dad (and my area of study is education!). It shows how powerful and affirmative social modelling can be. All the more reason Holly should never have been made to say "looking pretty" is an athletic ability. There is nothing wrong with a kid or adult wanting to look nice, but normalising that attitude is a concern. "So how pretty should I be?" is the problem that turns up when the girls get older. Books could be written about this show and I appreciate your highlighting of so many of these great qualities in this show. Thanks for your comment, Rich. Isn't Bandit so refreshing as a father character? He is one of my favourite parts of the series. Competent, involved, playful, but also fallible: he makes mistakes at times, but recognises these and then apologises to the kids. Many of us at ACTF love this positive representation of fatherhood, and it has definitely improved my parenting too! This is the best show on ABC kids. I sort of want to be more like Bluey's dad. I think many of us are aspiring to be more like Bluey’s dad! We can’t wait to see what the family get up to in the new episodes - coming to ABC Kids on 01 April 2019. Bluey is BRILLIANT! An involved and cluey Dad, with a NAME. A calm mum, with outside interests and a job. Kids learning through play. Really, really Aussie content. Longing for it to be accessible outside Oz, I want my friends’ kids to see it! Yes, fantastic local content that is sure to be a hit outside of Australia too – like much of our children’s content is! Completely agree with all of this. Their family structure actually makes us want to be more engaged parents. My husband sometimes comes home after Bluey has aired in the late afternoon and will put on an episode to watch with the kids before bedtime. He has declared it "the best show on kids TV" (especially had a bid laugh when the dad asked "who wants to watch the cricket"). We have a 4-year-old daughter who always leans towards 'boy' characters, I guess because they're typically more interesting, smart or capable. So, it's refreshing to see two girls - but really they're just 'dogs', like kids are kids at that young age and gender doesn't even have to come into the equation. And as for Peppa Pig - I can't stand that girl and what she expresses. Let's hope we can produce more of Bluey and more Aussie stuff like it. Exactly, Rachel! It is so refreshing to see a kids’ show that doesn’t stick to tired old gender stereotypes. We would love to see more children’s series like this! We all love Bluey in our family too. 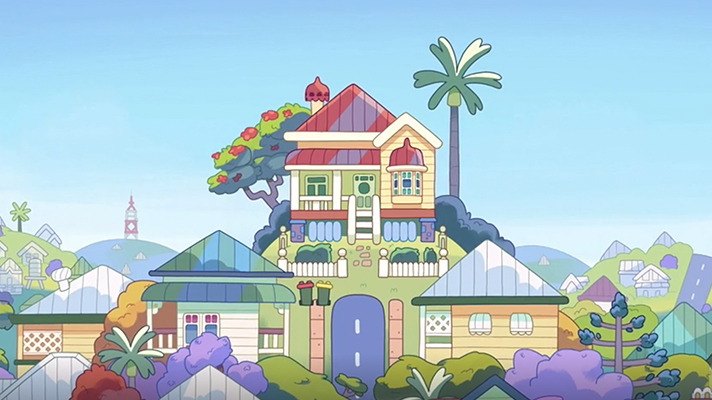 As an English family in Queensland, it’s proof of how we have all settled into the Queensland lifestyle as so many elements of Bluey are so recognisable. I think the parenting stuff is pretty international, we’re all knackered but trying our hardest to bring up the best versions of our small people as we can aren’t we?! But there is a distinctly Australian feel in there and I love that. Looking out for the small fries: Is it time to reconsider junk food advertising during prime time?